With the skill and expertise that we have developed over the years, FibreAid and its partners are able to assist companies with the design and implementation of all fibre optical networks. Whether you are designing a small point-to-point connection, a large fibre backbone network for an office or plant, or a multi-camera CCTV installation, we can assist you with your design so that you get the best performance from your network, and at affordable cost. Services have been supplied in and around Luanda for a numerous project and clients We provide fibre services for various projects on mines, vessels, oil rigs and factories. Services have been supplied for a numerous project and clients We provide fibre services for various projects on mines Power Lines, gas terminals and plants and factories for their process control and IT networks. Services have been supplied for a numerous project and clients We provide fibre services and products for various projects on copper mines, OPGW power lines projects and factories for their process control and IT networks. Services have been supplied, for a numerous project and clients We provide fibre services on a new mine, supplying and building their entire fibre and copper network for their plants IT and CCTV network. In addition supplied fibre services for the Tenke Village project ,Splicing testing of mines fibre installation and OPGW cable installation. Services have been supplied for a numerous project and clients We provide fibre services for various projects on mines for their process control, CCTV and IT networks. Provide fibre services/training and consultancy of the construction of a new mine in Lesotho, as well as provision of fibre services for a data center infrastructure build in Swaziland. Services have been supplied in Kigali and Kemembe,for a numerous project and clients We provide fibre services on a new mine, supplying and building theirentire fibre and copper network for their plants IT network. Additional services were supplied to local mobile operator for the termination of entire local fibre network in Kigali. Supplying of, fibre services at the local international airports. Splicing and testing of all the installed fibre cables located in and around the airports and terminals. Provision of goods and services for various mining companies, based in Ghana. Services ranged from splicing fibers for mines IT network and process control systems. Additional projects were the splicing of 20km OPGW fibre link between two mines. Ongoing supply of fibre cables and accessories to various clients in Ghana. Supply of fibre consultancy and training services to a local security company for the implementation of a fibre network utilized for security services. Ongoing provision of fibre cables, accessories and equipment to local companies. Provision of splicing and testing services for a new mine. The fibers were installed for the plant's process control system. Supply of goods and consultancy services, to various companies based in Uganda. Supply of fibre goods and installation services for local mobile operator, installing new data centers at various major cities around Tanzania. Ongoing provision of goods, to various clients in Tanzania, who are rolling out fibre networks. Provision of consultancy service for the local mobile operator, for the building of the metro fibre network. Supply of fibre splicing and testing services for a new fibre network across the island in order to manage am maintain their power grid network. 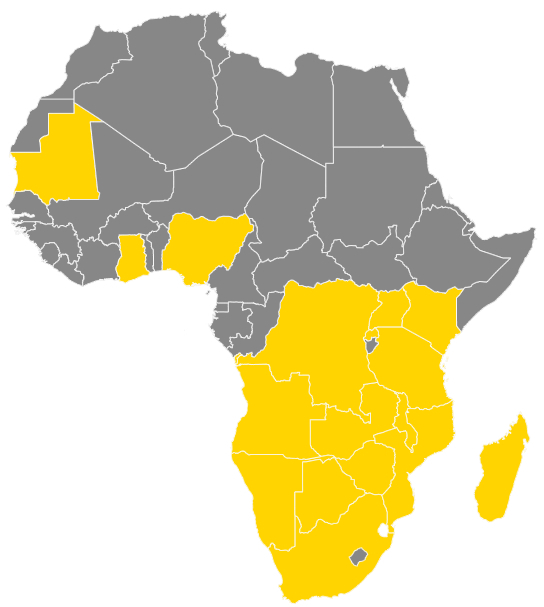 Location:South Africa is Fibreaid’s main country of work. Our services are offered anywhere in SA. Job details: include fibre services for offices, factories, mines, oil rigs, mining vessels, data centers, OPGW and FTTX These services are offered to a variety of clients. Services have been supplied all over Namibia for a numerous project and clients. We provide fibre services for various projects on mines, vessels power utilities and mobile operators on going provision of fibre cables, accessories and equipment to local companies. Services have been supplied in and around Luanda for a numerous project and clients. We provide fibre services for various projects on mines, vessels, oil rigs and factories. Services have been supplied for a numerous project and clients. We provide fibre services for various projects on mines Power Lines, gas terminals and plants and factories for their process control and IT networks. Services have been supplied for a numerous project and clients. We provide fibre services and products for various projects on copper mines, OPGW power lines projects and factories for their process control and IT networks. Provision of fibre services for the supply and installation of a new fibre network for a LAN type network. Services have been supplied for a numerous project and clients.We provide fibre services on a new mine, supplying and building their entire fibre and copper network for their plants IT and CCTV network. In addition supplied fibre services for the Tenke Village project, Splicing testing of mines fibre installation and OPGW cable installation. Services have been supplied for a numerous project and clients. We provide fibre services for various projects on mines for their process control, CCTV and IT networks. Bindura Mine – Termination of fibres for plant control automation system – 48 terminations Customer Wade Walker South Africa. This project was undertaken with Netconnect South Africa. This project was undertaken with Netconnect South Africa. Numerous fibres were installed from the server room distribution frame to various buildings within the complex. Fibres were terminated with Huber-Shuner connectors into patch-panels at each location. Where needed through-splices were used to connect other fibres. Once complete, the offices had a data and telephone network running over the fibre backbone. Completed 96 splices and 80 tests in 12 days. Virgin Atlantic was upgrading and building new offices and FibreAid was requested to complete the fibre optic splicing for this installation. Virgin Atlantic was upgrading and building new offices and FibreAid was requested to complete the fibre optic splicing for this installation. Splicing was completed on multi-mode armoured cable and terminated into fibre patch panels. Most work was done at Lagos International Airport, where a number of cables were run from the server room distribution frame. Completed 128 splices and tests in 3 Days. We have also completed numerous projects in Ghana on mining sites over the past 4 years. We have also completed numerous projects in Ghana on mining sites over the past 4 years. One of our bigger projects was for the Bogoso Gold mine where we terminated all the fibres for the plant’s new IT network upgrade. We also spliced a 60-kilometer OPGW line between the Bogoso and Wasa gold mines. Completed in 4 weeks with approximately 350 splices. Provided training for 10 employees over a five day training course. For this project we spliced approximately 720 single-mode fusion splices. For this project we spliced approximately 720 single-mode fusion splices. The fibres were installed for the plant’s process control system. Fibres were installed between various points around the plant and terminated into fibre panels. We have various customers in Uganda and Tanzania whom we supply materials. Splicing of all the fibres on the Morupule Colliery Expansion Upgrade project. Consultation on Broadband fibre rollout projects.